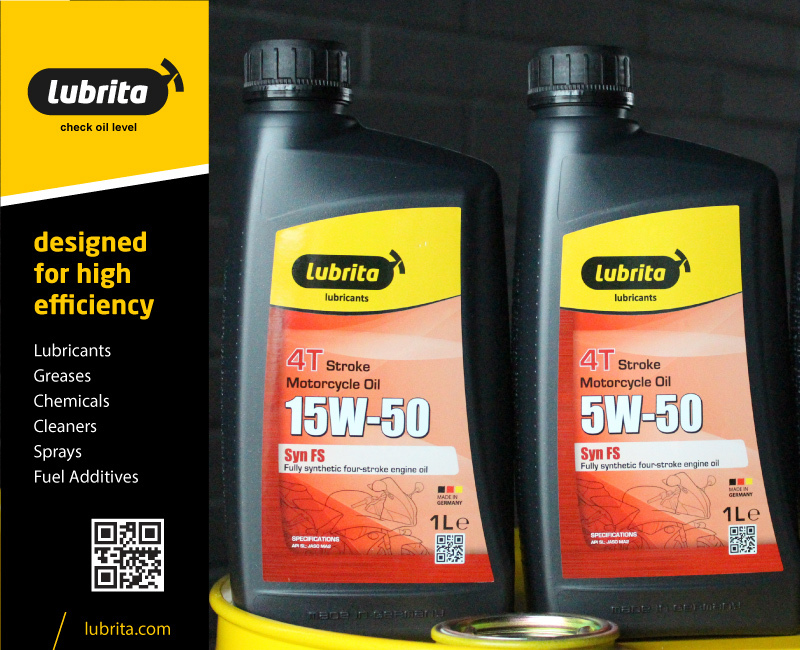 LUBRITA produce and supply worldwide very modern synthetic high-performance engine oils for 4-stroke motorcycles. Latest technology high-quality base oils are refined chemically and achieve a very high level of performance. JASO MA-2 approval guarantees the fault-free functioning of wet multi-disc clutches. Available in three viscosities grades SAE 15W-50, SAE 5W-50, SAE 5W-40 - LUBRITA MOTO 4T Syn oils has been especially developed for use in all motorcycles and scooters with medium to large engines, where a fully synthetic oil has not been expressly specified by the manufacturers. Ideal for motorcycles with wet multi-disc clutches. Also meets the highest standards and requirements of the motorcycles manufacturers. Motorcycles Lubricants OFFICIALY APPROVED JASO MA-2 specification by Japan Lubricating Oil Society. These oils is special developed for the lubrication of four-stroke motorcycles, so that sliding, sticking and/or rough changing of the clutch-plates no longer occurs. This oil is developed and tested in co-operation with the most important motorcycle producers and has its performance demonstrated in the field.